The Hillsborough Disaster occurred in an historical media framework that already labelled Liverpool as rebellious and anarchistic. The 1980's were the heady days of the Militant dominated council in the city. Not only the Thatcher government but also the Labour party under Neil Kinnock waged war on the leaders of the City Council (Derek Hatton and co). In reality they were waging war on the people of Liverpool - they became the real victims as they suffered the direct consequences of harsh measures imposed but also as they gained an undeserved negative reputation not only nationwide but internationally as well. It was this context which enabled the media to act so appallingly in relation to the Hillsborough Disaster. The Truth; some fans picked pockets of victims; some fans urinated on the brave cops; some fans beat up PC giving kiss of life. 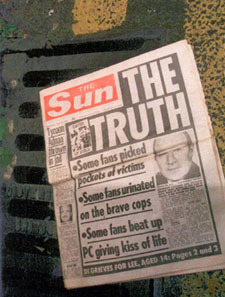 This was the front page of the Sun newspaper on the Wednesday following the Disaster. The question that has to be asked is where did the paper obtain its 'evidence' from - all routes lead back to South Yorkshire Police and the Lie Machine that was being put into operation. 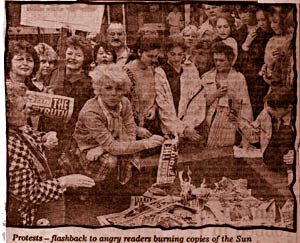 The response to this headline on Merseyside was one of outrage - thousand of copies were stolen and burnt and there followed a successful boycott campaign of the paper. To the present day that paper is still hated in the city of Liverpool and beyond and there are still shopkeepers that refuse to sell. Unconfirmed reports that a door was broken down at the end that was holding Liverpool supporters. ...at ten to three there was a surge of fans at the Leppings lane end of the ground… the surge composed of about 500 Liverpool fans and the police say that a gate was forced and that led to a crush in the terracing area - well under capacity I'm told, there was still plenty of room inside that area… It is important to note " police say". Here you have a situation which has to be interpreted as the police deliberately lying as we know that the police ordered the gate to be opened. The main culprits in spreading these lies were David Duckenfield, Chief Superintendent in charge on the day (who later admitted that he lied), Graham Mackrell, Secretary Sheffield Wednesday and Graham Kelly of the F.A. By the evening of the Disaster, Peter Wright, Chief Constable of South Yorkshire, issued a statement which acknowledged that the gate had been opened on the instructions of the police. Little notice was taken of this however, and other comments by Wright stated that the crush had occurred outside the turnstiles: By the late arrival of large numbers of people. This showed that Wright was merely operating a more sophisticated and subtle method of blaming the fans. The military language was a popular theme throughout the reporting of the Hillsborough Disaster. The Manchester Evening News was typical: The Anfield Army charged on to the terrace behind the goal - many without tickets. How long will it take for it publicly to be acknowledged that fans themselves share the blame?… The catastrophe was caused first and foremost by violent enthusiasm for soccer, in this case the tribal passions of Liverpool supporters. They literally killed themselves and others to be at the game. One had the impression that they were beasts waiting to charge into the arena. 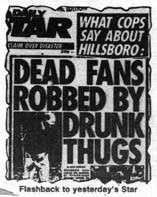 So it was at Hillsborough that the yobs made enough nuisance of themselves to convince the police that so-called gates of Hell were opened… the gatecrashers wreaked their fatal havoc. At best it was unfettered zeal. At worst it was uncontrolled fanaticism and mass hysteria which literally squeezed the life out of men, women and children. This was yobbism at its most base. People without tickets who had no right to be there were crushing to death their fellow Scousers. When it comes to apportioning blame, the accusatory finger can also be pointed at Liverpool. Scouse killed Scouse for no better reason than 22 men were kicking a ball. Given that this journalist was working locally you might think that he would be more likely to have his finger on the pulse. Apparently not. ...society had been happy to live with the myth that every football fan is a potential criminal. Well, nearly 100 people have just paid the price for this woeful misconception. I am sick of hearing how good the crowd were...They were arriving tanked up on drink and the situation faced by the officers trying to control them was quite simply terrifying. FANS IN DRUNKEN ATTACKS ON POLICE: Ticketless thugs staged crush to gain entry… attacked an ambulanceman, threatened firemen and punched and urinated on policemen as they gave the kiss of life to stricken victims. Sheffield police officers claimed tonight that drunkenness amongst Liverpool fans was at least partly responsible for the disaster at Hillsborough…According to the Police Federation a large number of Liverpool fans arrived at the ground late after drinking heavily and police couldn't control them. It seemed as if all South Yorkshire Police officers were giving interviews left, right and centre - all leading to the same kind of headline. The Times reported: Drunkenness and hooliganism were a major factor in the Hillsborough Disaster, police said yesterday.